Thigh “Highs” and a Dish Best Served Cold — or Not! I’ll admit it. I’m a thigh girl. I like my meat juicy and dark. Get your minds out of the gutter! I’m talkin’ chicken, people!! 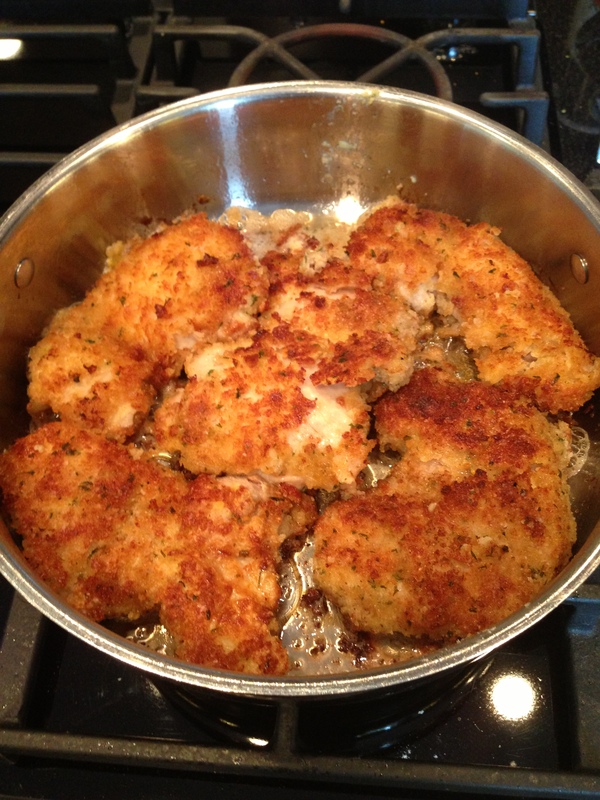 And while some people prefer the trendier, seemingly healthier, more low-cal reputation of Chicken Thigh’s stepsister, Chicken Breasts — when it comes to thighs, what’s not to love? They’re tender and moist. They’re awesome grilled. And — best of all — they’re cheap! When you have three growing children like mine who are ready to eat us out of house and home, that’s important! A ‘value pack’ of thighs ran me about $5 this week. That’s for the boneless, skinless kind — I’m too lazy to do that boning and skinning myself. That one package made two meals for our family. That’s why you saw grilled chicken thighs last night and are now about to see them again for tonight’s dinner. But tonight, I tried something new — I took them off the grill and warmed up the stove. Dip the thighs in flour. Dip them in egg whisked with a little milk. 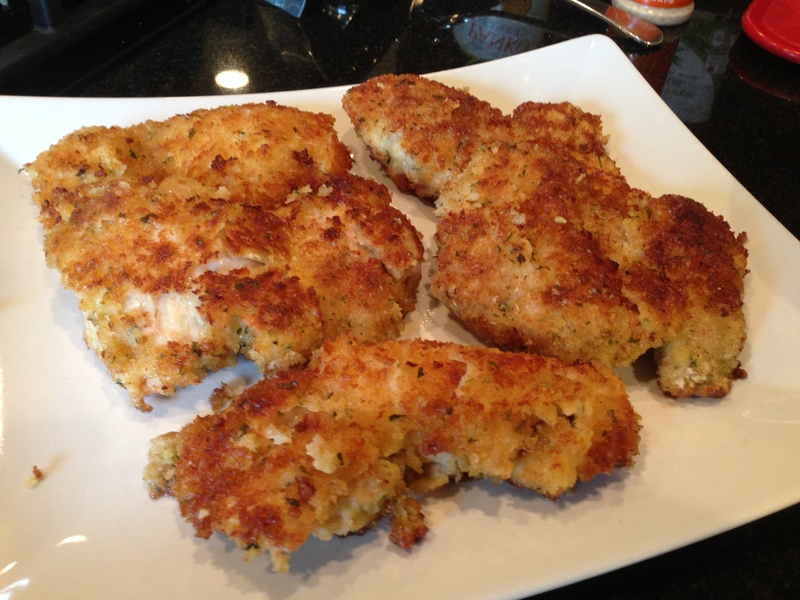 Dip them into Panko bread crumbs seasoned with garlic powder, salt and pepper. (Now — here’s the twist) Pan-fry them in toasted sesame oil until they’re cooked-through and crispy. I was a bit skeptical about this, but once I tasted them… they were pretty darn good. And the whole family thought so, too! The sesame oil made this dish really savory. The Hubs actually thought I had cooked them with bacon! I served these thighs with grilled potatoes and a cold Pea Salad. Annnnndddddd…. cue the awkward dinner moment. These dishes are not Random Acts of Cooking in our house. I’ve made them before. 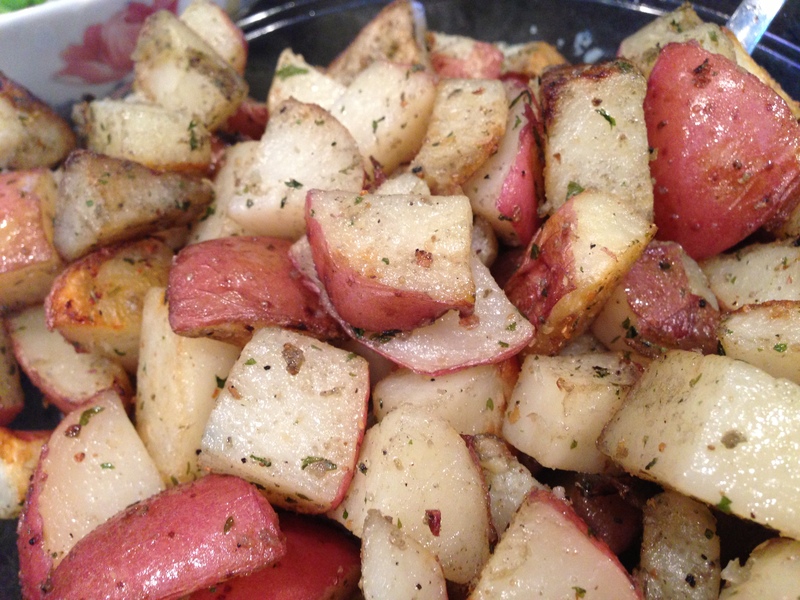 In fact, I grill potatoes all of the time without much ado! Tonight I used 6 red potatoes, stabbed them with a fork and microwaved them for about 6 minutes (just so they were soft.) Then I diced them, tossed them with olive oil, garlic salt, pepper and parsley and grilled them. 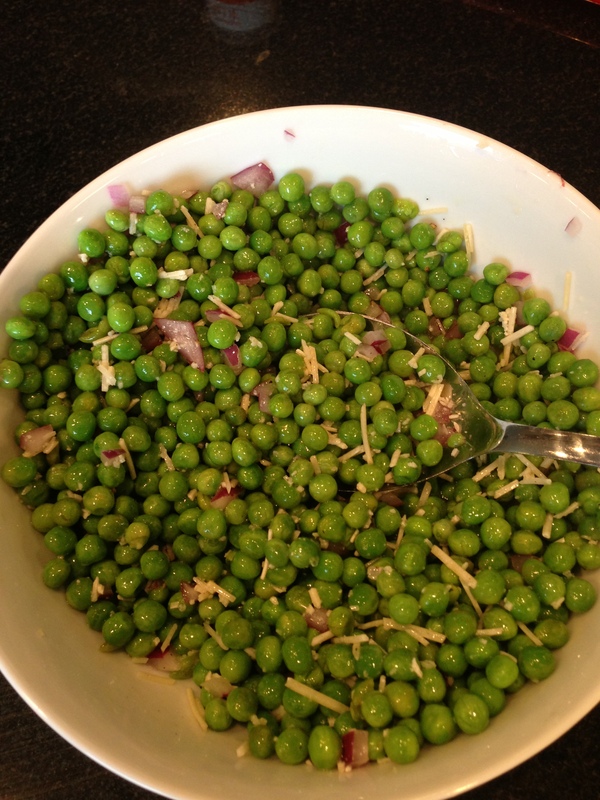 The Pea Salad is a cold side dish and is perfect for summer. I quick-thaw a bag of frozen peas under running cold water. Then I toss them with olive oil, a little diced red onion, the juice of one small lemon, some parmesan cheese and a dash of salt and pepper. Voila! Done! Plates were cleared — lickety-split. In fact, our 5yo dinnertime procrastinator hadn’t finished his meal by the time the rest of us were licking Oreo crumbs off of our fingers and, yet, he still insisted on finishing before enjoying his dessert! 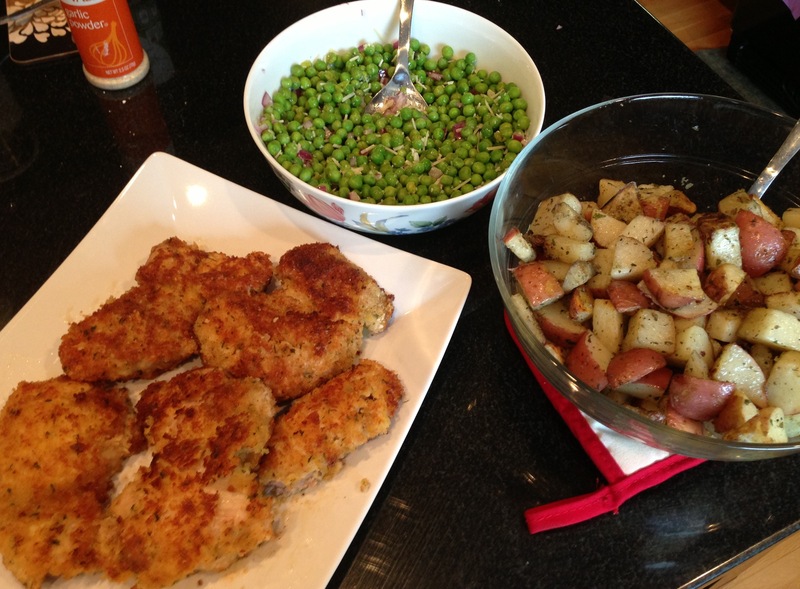 The Hubs hated these sides, leaving his peas and potatoes untouched on his plate. Ah well… guess you can’t please all of the people all of the time. Tell you what: I’m not cooking tomorrow. Or the rest of this holiday weekend for that matter. It’s my silent protest to his not liking my dish. 🙂 Really…. it’s just a way of saying I need a break from the kitchen. When you write a cooking blog, you tend to cook a lot. Mama needs a day or two off. Hope your holiday weekend is filled with Happy Eatings!! Can I request things? 😀 I am always in search of entire meals I can make ahead of time. I leave for baseball at 445 and don’t get back till around 7:15. Or later. I am the master of turkey chili and the such but need new material. This is only 2x per week during the BB season. Until basketball starts! Great idea, Kate! I’m always in search of those types of meals since we have a lot of evening activities here, too. I’ll do some research and see what we can come up with to test the kiddos. I actually have a couple of ideas in mind already…. ps… a friend of mine suggested I try making the Chicken Soft Tacos that I posted about a couple of weeks ago in my crock pot. They turned out great!! I mixed a packet of taco seasoning with a jar of salsa and poured it over 3 chicken breasts in the crock pot. Then cooked it for 6 hours on low and shredded the chicken once it was tender. It was delicious… and so simple. I think we could have skipped the taco seasoning, to lower the sodium level, and it still would have been really good. We came home after a long day out to a dinner that was all ready to go. I definitely need more of that type of meal in my repertoire.